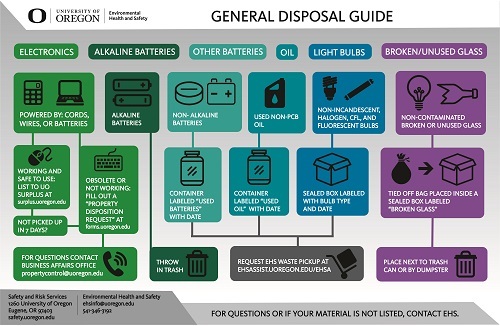 Environmental Health and Safety (EHS) collects hazardous materials in several categories for disposal, treatment or recycling for all UO departments. Submit a service request through the Environmental Health and Safety Assistant (EHSA) online system. Login to your workgroup's on-line interface. You will then be able to submit requests and view the queue of existing requests. Please review a short tutorial on waste pick-up submittals. If you are having difficulties with the EHSA online system or need a login, please contact Matt Hendrickson. Allow three business days for collection. Submit your hazardous waste pick up using this link. Both the username and password is “Guest” then click on “Login”. Click on “Add Waste Pickup Request”. Select the appropriate pickup type. Type the description of the waste with as much detail as possible. For location type, click on “non-standard”. In location box, please type the location of the waste including building name and room number. In the contact phone box please type your UO phone number or your UO department number. In the comments section please indicate any other information that would be helpful for us to know. If your request is urgent, please note this in the comments section. Typically waste is picked up within three working days. NEW!! We have created two poster to illustrate various lab and general waste streams. Feel free to print and post in your lab or workplace, or request a hard copy from EHS. For more detailed information, refer to the UO Hazardous Materials Guide.